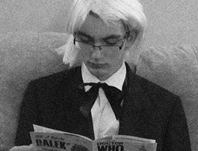 Conrad is 16 and has been a fan of Doctor Who since he was 7. His favourite Doctor is Patrick Troughton, not Hartnell as you might have thought from his picture. He also came up with the idea of the podcast, something which he is very proud of. Will is also 16 and also became a fan when he was 7. His favourite Doctor is Peter Davison, but not because he grew up with him. He can be found on Twitter. He has met Katy Manning as you can see above (lucky bugger).